Reprinted with permission from Lest We Forget: An Account of Agnes Scott College, by Walter Edward McNair, Tucker-Castleberry Printing, Inc. 1983. Copyright Agnes Scott College. 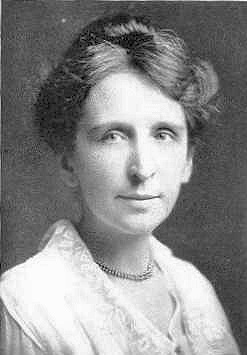 Professor Anna Irwin Young was born in the greater Pittsburgh, Pennsylvania, area on November 25, 1873. Her father, the Rev. Samuel Young, a native of Ireland, was at the time pastor of the Sandusky Street Church in Allegheny just across the Allegheny River from Pittsburgh. In the middle 1890's Mr. Young moved his family to Atlanta where he lived for the remainder of his life. For two years beginning in 1893, Anna Young was a student in Agnes Scott Institute, apparently completing her work in 1895. In 1898 she was appointed to the Department of Mathematics, rising to be Professor of Mathematics, a post she held until her death in 1920. She also served as Librarian from 1898 to 1902. When Agnes Scott became a college in 1905-1906, she continued in the college faculty; however, feeling that she should have a degree, she took the requisite courses and received her B.A. degree in 1910 although while she was pursuing this work she was concurrently Professor of Mathematics. Professor Young took a leave of absence in 1913-1914 during which time she received her M.A. degree from Columbia University. [In 1916 she became a charter member of the Mathematical Association of America.] She died quite unexpectedly of pneumonia on September 3, 1920, while visiting relatives in Pittsburgh. From every evidence at hand, Professor Anna I. Young must have been one of the most effective and greatly loved faculty members who ever taught at Agnes Scott. Shortly after her death, a little pamphlet was published entitled simple "Miss Anna." This pamphlet tells of her excellence as a teacher, of her concern that her students do well, and of her understanding of their difficulties. One account is of a senior who repeatedly failed trigonometry "until the day came when she had the last exam that she could have on it. And she'd studied so hard and was so scared that in the glare of the classroom and under the sound of the thumping of her own heart she forgot everything she knew and didn't try to work some of the problems. That night she was sent for and she went to Miss Young's room. 'Now,' said Miss Young sweetly and firmly, 'I know you know this, and I know you can work these problems. Sit down in that chair and work them.' And there in the quiet she worked them. And so — she passed." It is hard indeed for the students of Agnes Scott to express our grief. Our sense of loss is too great, for Miss Young was everything to us that a fine professor, a friend whose sympathy was unbounded, and a Christiam character, whose life was all service for others could be. In everything that pertained to our college she was sincerely interested. An alumna of Agnes Scott herself, she was tireless in her activities in behalf of the alumnae of Agnes Scott, and always the staunchest supporter of everything that could contribute to the welfare and growth of our college. And in the students and their affairs, there was none more helpful. Whether we went to her for advice in personal affairs or in those things that concerned the college community, we found the same ready counsellor and willing spirit. She helped us with our little tasks that were hard, and again with student government affairs, our Y.W.C.A., our united war work drives — in fact, with everything that demanded real aid. The Class of 1920, the last group that Professor Young lived to see graduate, dedicated [the college yearbook] The Silhouette to her with these words: To her whose loyal devotion has ever been an inspiration in our college life. When the Alumnae House was erected in 1923, it was named the Anna Young Alumnae House in memory of Professor Young. In the main hall of this building hangs a panel which features a profile likeness of Miss Young. Below the likeness is inscribed one of her favorite quotations: "Till the day dawns." She undoubtedly was a catalyst for excellence and goodness in the early days of Agnes Scott. All Agnes Scott Alumnae are familiar with the name Anna Young, but who was she? We all know the Alumnae House was named for her, but why? Anna Young was born in Pittsburgh, Pennsylvania. The Rev. Samuel Young, her father and native of Ireland, moved his family to Atlanta in the 1890's. Anna Young enrolled in the Agnes Scott Institute in 1893 and completed her studies in two years. After her graduation from Agnes Scott in 1895, she joined the mathematics department, rising to the position of professor of mathematics. When Agnes Scott Institute became Agnes Scott College, Anna Young enrolled as a student to complete her degree requirements while continuing to teach mathematics. She received her B.A. from Agnes Scott in 1910 and her M.A. in mathematics from Columbia University in 1914. As a teacher, "Miss Anna" held her students to a high standard, but her students loved her and appreciated her efforts to help them understand mathematics. She went to great lengths to help her students learn, and many students who would have otherwise avoided mathematics took courses because Miss Anna was the teacher. Miss Anna did not limit her interest in her students and their studies. She sponsored the YWCA on Campus, was the housemother of Sturgis Cottage, led the War Work Drive during WWI and solicited student pledges for an endowment campaign. She participated in faculty plays and skits as well as planning activities for alumnae returning to campus for Commencement. As a member of the faculty she was valued for her willingness to assume more than her share of the work by serving on and leading faculty committees. Miss Anna was also a charter member of the alumnae association, attending the organizing meeting of the Agnes Scott Club the evening of her graduation from the Institute in 1895. She served as the first vice president of the club. In addition to her Agnes Scott commitments, Anna Young was an active and devoted member of Central Presbyterian Church in Atlanta where she taught a class of young girls and participated in Sunday school activities at several mission churches sponsored by Central. One aspect of Miss Anna's character that everyone remarked upon was her deep Christian faith. She did not speak much about it, but her faith shone through everything she did. Miss Anna caught pneumonia and died prior to the opening of the school in the fall of 1920. She was not quite 47 years old. The outpouring of grief from the students, the faculty, family and friends was overwhelming. After her death the College newspaper carried a tribute to her. A small book of memories entitled Miss Anna was published. The Silhouette was also dedicated in her memory that year. In remarks at her funeral, Agnes Scott President Frank Henry Gaines said, "A truer woman, a finer character, a more devoted Christian, a more useful member of the College community, it would be difficult to find."